Et Voilà is a new storage system developed with the intention of looking at the paradigm of ‘containing’, for both home and non-home purposes, from a different point of view and to introduce new ways of using furniture. Taut fabric has the ability of closing furniture to the point that the perception of any doors disappears. The end result is that it almost looks like a magic box whose indefinite surface gives the viewer a sense of estrangement. The classic lacquer doors and glass have disappeared giving way to a single fabric-coated door that is as long as the length of the furniture. 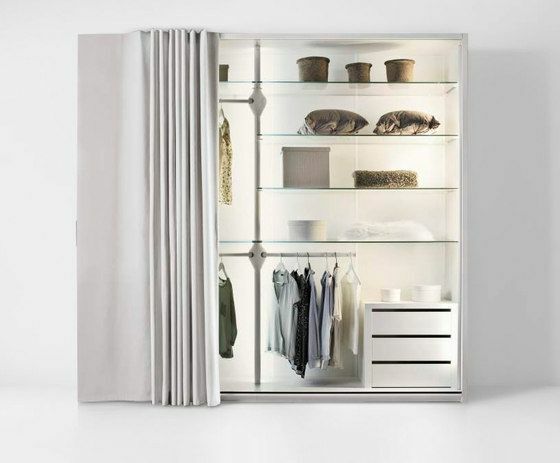 The Et Voilà wardrobe not only has shelves and drawers but it can also be fitted with a rotating metal shaft for holding clothes. The height of the shaft’s joints and its branches can be adjusted thus creating the space that is needed; a product that moves and changes along with one’s personal requirements, in the name of usability.